For the first time in a few years, the Seven Persons School music class will playing tunes in front of peers, family and friends in a fundraising event on April 6. “Ovation” will be a celebration of music that recognizes past and present students musical talents and money from the fundraiser will go towards purchasing new band instruments, to help fund drama production and other gym equipment. Tiffany Molin, who is a CO-planner for the event and a music teacher at the school, tossed around the idea of a fundraiser back in the fall with previous teacher Dennis Orr, who she rehearses with in his Glen Morin music group. 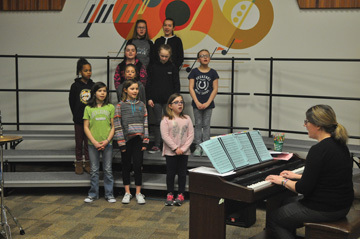 “ He has a lot of the older students still that he’s in touch with that are carrying on with music programs of their own or continuing on with community, whether their involved outside of their regular job or school,” said Molin. During the dinner, the school’s alumni will perform individual pieces and then after the meal the junior high band, elementary choir, a ukulele group and solos and duets will perform before the Glen Morin band will end off the evening. “I think a lot of it has to do with pride in their community and to being able to share something they enjoy with other members of our community ,” said Molin. Many of the musical pieces played will be contemporary, but Molin says while she knows a lot of the students’ work that others will make theirs a surprise. “My students will play a traditional concert band piece and a piece of pop music,” she said. Student Izzy Sumners says the music program is fun and has taught her a lot about the importance of music with the life lessons of singing and just knowing how to play musical instruments. “I think just showing everybody how we practice a lot and how hard we’re working to show what we can do and trying to have people come to this awesome music program,” she said. “Ovation” takes place on April 6 from 6 p.m.-9 p.m. at the school’s gym. Tickets are available through calling Seven Persons School or are available for parents through the online cash system.